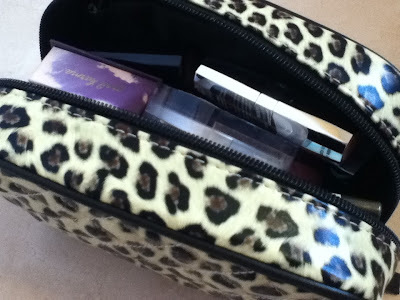 Guest Post: Make Up Bag Staples! As my own blog is predominantly beauty related, I thought I'd share with you my 'Makeup Bag Staples' - an array of products that I simply feel I couldn't live without. 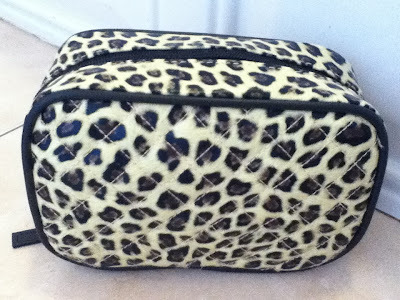 My everyday makeup bag is part of a set that I got from Lori Greiner last Spring. This is the smaller of the two which makes it great for keeping in the things that I use on a daily basis. Like Hayley, I'm currently pregnant, so my makeup routine has definitely dwindled over the past seven months or so. However, the products that I'm talking about today are ones that I can use quickly and easily so I'm not going out every day looking like I've not made any effort whatsoever. Primer: Benefit's The POREfessional is my favourite primer. I find that it sinks into my skin quickly and reduces the appearance of pores. Although nine times out of ten I use this underneath my foundation, I found that it can also be used alone. Foundation: It's only recently that I discovered the PurMinerals 4-in-1 Pressed Mineral Makeup Compact but it has fast become a part of my every day makeup routine. It's so easy to use - just buff into the skin and you're good to go! I tend to just wear one layer of this but if you're someone who likes a heavier coverage of foundation it's really buildable as well. Concealer: Last year I decided to try Benefit's Erase Paste to hide the bin bags under my eyes. Little did I expect it to end up being the best concealer I'd ever tried. I love everything about this from the creamy texture to the way it blends so easily. One little pot has lasted me a long while and I use this absolutely loads! Blusher: My readers over on Confessions of a Secret Shopper see me rave about Benefit's Hervana week in, week out. I adore this blush and use it almost every day. It gives a lovely flush of colour without being too over the top and if you sniff the product (I know, I'm weird) it smells absolutely divine. Bronzer: I've only recently got into bronzers and use them to contour more than anything else. 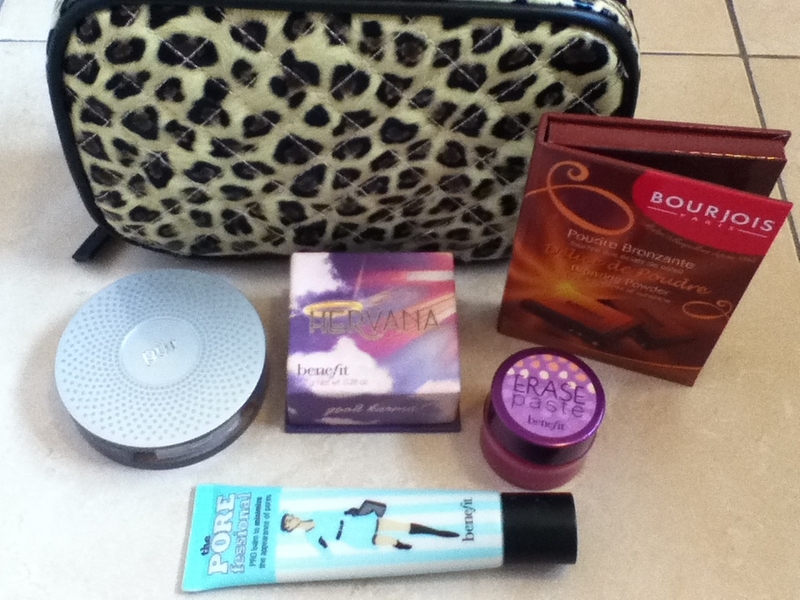 My favourite so far has to be the Bourjois Delice de Poudre bronzing powder. It's really subtle on my vampire pale skin and it smells like chocolate ... what more could a girl ask for?! Eyeshadow Primer: For years now I have used the Original Urban Decay Eyeshadow Primer Potion. I like the texture and it really does give your eyeshadow a real 'pop' of colour when you use it underneath. Eyeshadow: I recently discovered the Maybelline 24 Hour Color Tattoo's in Permanent Taupe and Pink Gold. Now, I can't vouch for them lasting for a full 24 hours as I've never had to wear makeup for that long, and I'm a good girl, I take my makeup off before I go to bed. However, they make a great base for regular eyeshadow in similar colours ... which brings me to my next product: The MUA Undressed Palette. 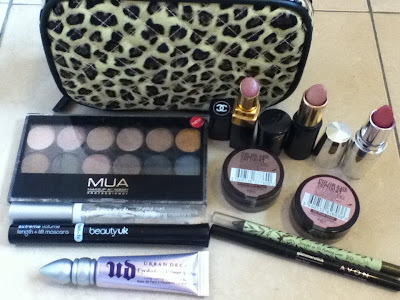 A great alternative to spending a fortune on the Urban Decay Naked Palette. Both have the exact same shades. The only noticeable difference to me is that the MUA version has more product fallout. Eyeliner: My two most used eyeliners are the Avon Glimmerstick in Blackest Black, which lasts for an amazingly long time, even on the waterline. And Pixi's Straight on Till Morning liner in 2nd Star Twinkle, which is a gorgeous jade green colour with a hint of glitter. Mascara: My most used mascara has to be the Beauty UK Crystal Curl Clear Conditioning Mascara. I use this as a prep before applying my black mascara. It feels so nice on the lashes and really does leave them feeling conditioned. I've recently started using a second Beauty UK Mascara: Lash FX, as my favourite (17's Wild Curls) has been discontinued. Lipstick: I'm a bit of a lipstick hoarder and have way too many in my collection. The three that I love and wouldn't want to live without though are Chanel's Boy, No 7's Divine and Avon's Pucker Up Pink. Although they are all shades of pink, they're all very different. Well, I think I've gone on for long enough now! I do apologize for this being such a lengthy post but I hope you enjoyed it. Feel free to leave a comment in the box below and tell us what you consider to be your 'Makeup Bag Staples'. Thanks again to Hayley for giving me this opportunity to write for you guys. I also LOVE the Bourjois bronzing powder and its very much part of my everyday make up routine too! I would LOVE to try the Urban Decay primer, this has been on my want list for a while now! Louise - your make up bag looks so neat and clean! I'm jealous!!!! Thanks for letting me Guest Post for you. Wow, it seems really good! Thanks for sharing! I'm always on the lookout for a good eyelastin.